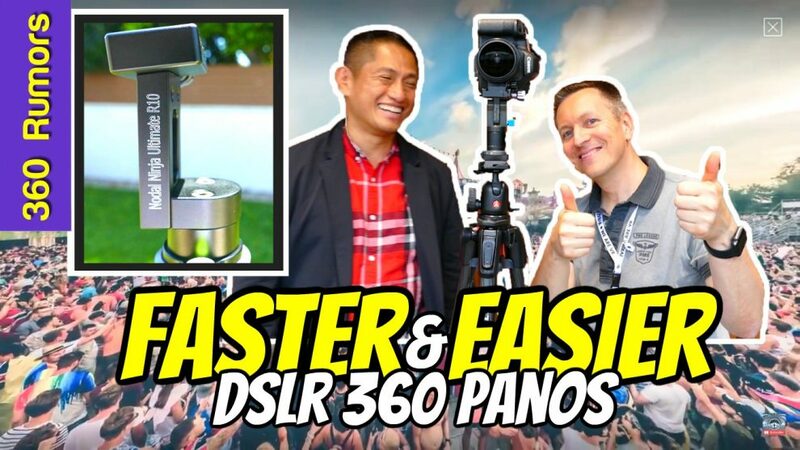 360 photos shot with a DSLR and a panoramic head have much higher quality than typical 360 cameras, but they also take more time to shoot. However, there is a faster and easier way to shoot panoramas with a DSLR — using a ring mount panoramic head, such as the Nodal Ninja R Series. For this tutorial, I invited an esteemed guest: Peter Van den Wyngaert (LittlePlanet.be), who won 1st prize at 360 Cities’ Panoramic Video of the Year, and also won the grand prize at IVRPA’s Street View Challenge 2018. Last week, I posted a tutorial for shooting with a multi-row panoramic head. In that tutorial, I mentioned that for virtual tours, fisheye lenses tend to be more popular because they require fewer shots, which not only saves time, but also means there is less chance for stitching errors. Taking that logic one step further, it is possible to shoot a fully spherical 360 photo with just 4 shots from a circular fisheye or a cropped circular fisheye, using a single-row panoramic head, such as the ring mount Nodal Ninja R series (R1, R10*, and R20). The R series uses lens rings that allow the lenses (not bodies) to be mounted on the panohead. *The R10 with fixed tilt has been discontinued and replaced by R20. The R series is much more portable and because it is a single-row panoramic head, it reduces the chance of shooting error compared to using a multi-row panohead for a single-row capture. It is also more compact. As I mentioned in the video, a single-row panoramic head will require a lens that is sufficiently wide in order to produce a fully spherical panorama. You can use either a circular fisheye, or a cropped fisheye (180 degrees on the long edge). Here are examples. 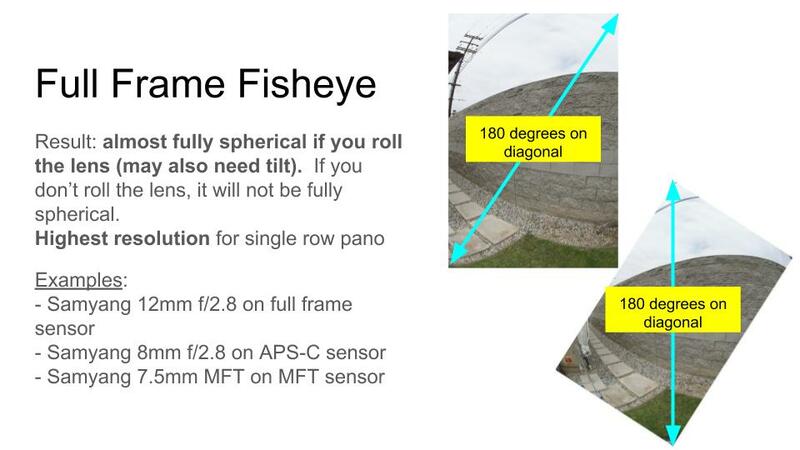 Circular Fisheye lenses: fully spherical panorama on single-row head (but will have the lowest resolution). Number of shots required: 3 or 4. Cropped Fisheye lenses: fully spherical panorama on single row head if the FOV is at least 180 degrees on the long edge. Will have higher resolution panorama than circular fisheye. Full frame fisheye or diagonal fisheye (180 degrees on the diagonal): If you don’t roll the lens, it will not be fully spherical on a single-row panoramic head but this can be almost fully spherical if you roll the lens, such that the diagonal of the frame is vertical to the scene and covers the zenith and nadir. There will usually be a star-shaped gap in the nadir. Also note that more shots will be required (usually 8 shots), which means more possibility for stitching errors. Manual focus ring? Aperture ring? WHAT DO I NEED TO BUY and HOW MUCH WILL IT COST? Here’s what you need to get in order to shoot fully spherical 360 photos with a ring mount panoramic head such as the Nodal Ninja R Series. 1. DSLR or mirrorless interchangeable lens camera. Unlike a multi-row panoramic head, you cannot use just any camera such as a point-and-shoot camera or bridge camera. It has to be a DSLR or mirrorless interchangeable lens camera preferably with a fisheye lens supported by Nodal Ninja. Should you get a DSLR or mirrorless? Full frame or APS-C or Micro Four Thirds? See this post. 2. A fisheye lens. To make it easier, choose a lens that is supported by Nodal Ninja. However, just because Nodal Ninja supports a lens doesn’t mean that lens is good. For example, Nodal Ninja supports the Sony 16 f/2.8 fisheye and as someone who owns that lens, I can tell you that lens is crap. 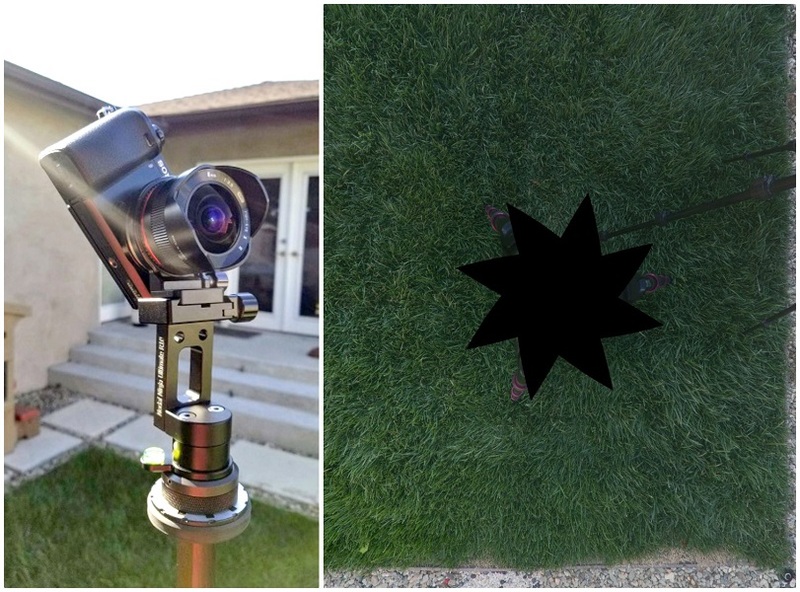 To get the maximum resolution spherical panorama for a single row panorama, choose a lens that will give a partial circular fisheye coverage (180 degrees on the long edge). Alternatively, for better stitching but lower resolution, choose a circular fisheye lens (180 degrees on the short edge). 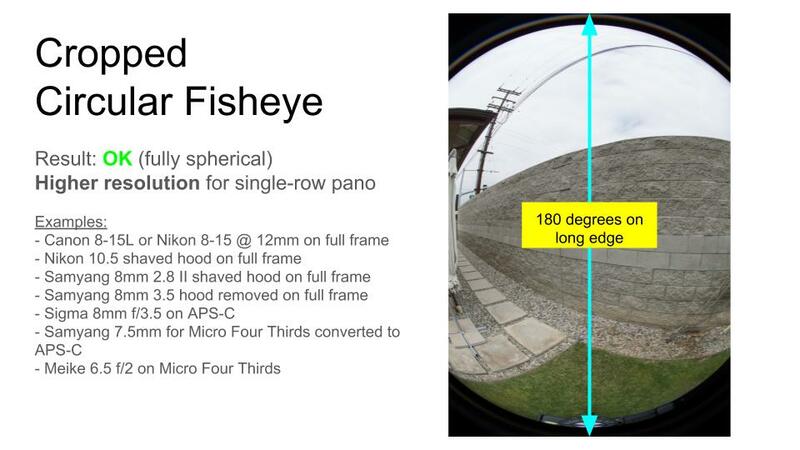 A full frame fisheye lens (180 degrees diagonal) can also be used, but it will require more skill with stitching. If you have a Canon or Nikon with APS-C sensor, Nodal Ninja’s distributor recommends the Sigma 8mm f/3.5 ($899) for Nikon or Canon . You can also use the Samyang 8mm f/3.5 lens. If you have a mirrorless APS-C sensor, a good option is the Samyang 7.5mm f/3.5 ($219), a lens that is actually a full frame fisheye lens designed for Micro Four Thirds but can be used with mirrorless APS-C cameras to yield partial circular fisheye coverage, with good results. If you will use this combination, you’ll need the Nodal Ninja conversion kit for your mirrorless APS-C camera. (Fanotec also sells a conversion kit for Sony E-Mount, Fuji X-mount, Canon EF-M mount, or Samsung NX mount). This is the combination I got for my Samsung NX500 camera, and when the lens and kit arrive, I’ll post a comparison with my other fisheye lenses. For full frame mirrorless, Samyang 8mm 2.8 II with a shaved hood will result in a cropped circular fisheye. 3. Nodal Ninja R series panoramic head with rotator. Fanotec has the R1 and R20 (the R10 is discontinued). 4. Lens ring for your lens ($75 to $110). This is the second part of the panoramic head. Choose the lens ring for your lens. 5. Stitching software. There are many available. PTGui and Autopano Pro ($115) or Autopano Giga ($250) are popular. I also like Panorama Studio 3 Pro for its ease of use and good stitching. All of them have trial versions available. Or you can get Hugin, which is free but more difficult to use. Update: I found that for diagonal fisheye, Panorama Studio works well. For circular fisheye and cropped fishey, PTGui works better. 1. Sony a5100 body only ($348) or Sony a6000 ($448). The advantage of the a6000 is that it has two command dials. The a5100 has only one command dial but it has a touch screen. 2. Samyang 7.5mm MFT ($219). This is actually a Micro Four Thirds lens, but it works well for APS-C as a partial / cropped circular fisheye lens, ideal for fully spherical capture with just 4 shots on a single-row panoramic head. 3. Nodal Ninja R20 package with Samyang 7.5mm lens ring ($260) – this includes both the R20 head and a lens ring for the Samyang 7.5mm lens. 4. Nodal Ninja conversion kit for Samyang 7.5mm for Sony E-mount ($125) – this is an adapter to use the Samyang 7.5mm (Micro Four Thirds mount) on a Sony E-mount. It also lets you use a Nodal Ninja lens ring. One thing that surprised me after all the talk about being careful to avoid shake due to multiple matching shots for HDR, he would then take the shots by pressing directly on the camera shutter button (which increases the possibility of throwing the camera out of alignment) instead of using a remote release ! Seems to me that the use of a remote release should be among the recommendations just to avoid any possibility of accidentally messing with the alignment. If you look closely, I use a 2-sec timer to start the capture to avoid any shaking. My setup is sturdy enough, it won’t throw the camera out of alignment. I use a remote on locations where the floor is not stable enough, or where I could generate unwanted reflections or shadows, or when I can’t reach the camera (on top of carbon poles). Hi Francois, if you look again, I use a 2-second timer to avoid camera shake. My setup is very sturdy, so it won’t put the camera out of alignment when I use the trigger. I only use a remote if the floor is not stable enough, if I cast shadows or generate reflections, or if I can’t reach my camera when it’s on top of a large pole. If I can avoid using a remote, I will, less hassle is better imho. > I use a 2-second timer to avoid camera shake. Ah OK. That’s a good thing to point out. I personally would still choose a remote release because I often can’t spare the 2-second delay when shooting multiple shots. I am sure it is but I bring this up because people reading this and wanting to try it out may not have the sturdy equipment you have. 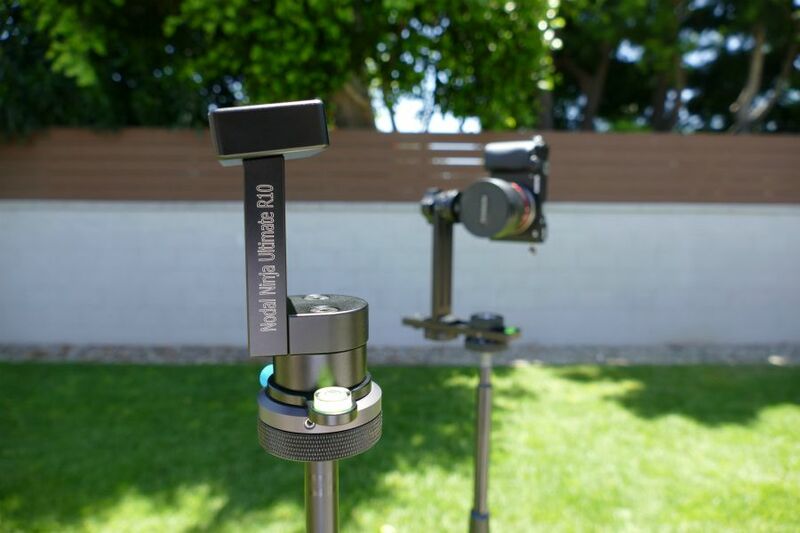 I use very heavy Manfrotto tripods but I also have some light tripods that are easily thrown out of alignment. All good examples. You make my point. I would also add those circumstances where there are people around in the scene and you try and shoot in that tiny time frame when there’s nobody there and have to take all those shots as fast as possible. Sure, they could be edited out… but if I can avoid the hassle, I will. That’s good but it’s still a good idea to be cautious. But my point here isn’t to tell experienced people what to do but to keep in mind that new users reading this might not be so careful and a remote release can help in that respect. Your videos are inspiring and motivating, Can I shoot 360 pictures with a Cannon 600D using a EFS 10-18mm f4,5,- 5,6 IS STM lens? I have a Benro T600EX (Photo & video tripod. Will this equipment be enough to shoot 360 photography in order to take it to a professional level? Please advice. Thanks so much to you and Peter for an excellent demonstration! I’m quite interested in trying out some 360° panorama photography myself but I’m finding the wide range of Nodal Ninja heads & mounts confusing, to say the least! I have a Fuji X-T2 mirrorless camera and am considering getting the X-mount Samyang 8mm Fisheye F2.8 II lens. From the information given here, I’m assuming I’d need to shoot 8 shots diagonally using an R series mount like Peters, but this would leave me with a star-shaped gap at the nadir. In my situation, would the Nodal Ninja III mark III be the better option? Yes with the Samyang 8 2.8II, you can get 8 shots diagonally and there will be a star-shaped gap. Here is a sample with the Sony a6000 and the Samyang 8 2.8II with the R10 (8 shots single row) https://roundme.com/tour/273673/view/901695. Personally in retrospect I think what I would have liked is the RS-1, which is a multi-row ring-mount panohead. But anyway I will get it today and test it out if it’s as good for me as I think. Fantastic. Thanks for the detailed reply Mic :-). The R1 panohead does look easier to use than the NN3 and less cumbersome too. I have a job coming up in a few weeks that requires the capture of 360 HDR images for reflections and lighting of CG elements. This might be the perfect excuse! So much information to take in when starting out. I’m an experienced photographer but not in 360. I have a Fuji X-T3 and am looking to get a Samyang 8mm lens. Will the Nodal Ninja Ultimate R1 Adjustable Tilt Ring Mount be all I need, or do I need something more? TIA. Hi Freddie! you can use the X-T3 with Samyang 8mm, but just fyi the camera has to be rolled around 30 degrees, and then you take 8 shots. The stitching is more tricky than a 4-shot photo with the Samyang 7.5mm (you’ll need the conversion kit for Fuji X-mount). Appreciate the reply, Mic. I’ll look into it and contact Nodal Ninja about what I need to buy. Thanks Mic, appreciate it. Great YouTube channel by the way. After asking Mic’s advice, I purchased the Nodal Ninja Ultimate R1 with adjustable tilt, the RD5 rotator and Samyang 8mm Lens adaptor for my Fuji XT-2 and I’m very happy with it. I bought it as a kit from panosociety.com, as the kit and their European location worked out cheaper for me in the U.K. Thank you so much for taking the time to write that reply for me. I’ve copied and pasted that for keeps. I’ve been a photographer for 10yrs and have spent 3yrs working professionally. I’d like to be able to offer clients 360 images of their restaurants and venues etc. HDR work, post processing is not new to me, but 360 imaging is. I’m very much looking forward to the challenge. Thank you so much for this informative post. I learned a lot from your clearly designed charts and numerous examples. I ended up purchasing a Nodal Ninja r20 (with your discount code) and Samyang 8mm lens for my Sony A7. I had to shave the lens hood. I found a tutorial on vimeo and was successful. Perhaps you may want to offer a similar tutorial. Thank you again. I am a big fan! Hi, Mic. Thank you for an “affordable but decent quality kit”. It is so useful for newbies. But can your add more combinations for different price ranges? What is the combination for the fastest panorama creating (for outdoor virtual tour). Thank you for your clarification regarding sensor / lens / resolution – correlations, that already helps a lot Mic! Nevertheless I still have concrete questions about 4K-filming for VR180 with 2x Sony A7S II (I have and need these cameras, because I only film in lowlight situations): which lens would you recommend, the Samyang 8mm or the Meike 6.5mm or another? Yes, vertically it doesn’t reach 180° at full format, maybe 100-120°, but horizontally full 180° should be visible. Can this work at all, what would you recommend for this camera to realize VR180 3D? I would like to get a setup for my Sony A7III. Could anyone make any gear suggestions…Fisheye Lens & Ring? Hi Owen. For A7III I recommend either Samyang 8mm (4 shots) or Samyang 12 2.8 fisheye (8 shots). just search their site and you will find the lens ring for those. BTW you can get a discount from nodal ninja with the discount code 360r10. What are your thoughts of the Roundshot VR Drive II (robotized gear) ? Compared to a Nodal Ninja setup. Hi Mic, thanks for your post it was really awesome and informative. I have a dilemma, I am often contracted by a marketing company. They just notified me that I have to upgrade my still camera and my pano camera to full frame to give more value and suite the needs of their clients better. I am currently using an A77 Mark II for my stills with a tokina 11 to 16. And a Nikon D90 with the sigma 8mm 3.5. I’d love to break the bank and get an A99 Mark II but I don’t think the wife will go for it. So I was thinking to get a Nikon D700 if the sigma 8mm will work with that body. Then after that I would only need a wide-angle lens for my still shots. Hopefully I could keep this under $1,000. I do have some decent Minolta glass, that’s why I was hoping for a very big upgrade on my Sony camera body. Do you have any suggestions about which ways I could go and what might work better for me, I shoot a lot of ice hockey and golf and misc sports. Hi Russ! Sorry for the delayed reply. D700 and Sigma is ok, although I find Sigma a bit soft on the edges. Another setup you could try is the Sony a7R and a Samyang 8mm. 4 shots for a 360 photo. Or Samyang 12mm – 8 shots for a 360 photo. Thanks again! Hello Mic, I have a Fuji XT2 and a Samyang 8mm 2.8 II. From your words I don´t have clear if that would work for 360 panos. Can you please help me with this?? I appreciate your assistance as I read different things in different places and do not know exactly what to do. I have the same set up as you and I can confirm that what Mic says is spot on. I use the horizon line on the XT-2’s rear screen as a guide and rotate the camera until the line is positioned roughly bottom left to top right. I also have it tilted down a little to reduce the size of the hole in the nadir. With this configuration, I’ve found that six shots along the horizon and two zenith shots (the second taken at 90° rotation to the first) gives me great coverage and it’s a breeze to stitch in PTGUI. Thanks Andy, now I almost understand it. As I am new on 360 I am still trying to figure out many things but now I know I can manage with the Fuji XT2 and the Samyang 8mm although I will have to get the R1 ultimate + rotator and the ring for the lens. What do you mean when you say 90º rotation to the first???. About the Nadir I saw Peter simulating he could take a shot to the Nadir too, right??? Why don´t you do it?? 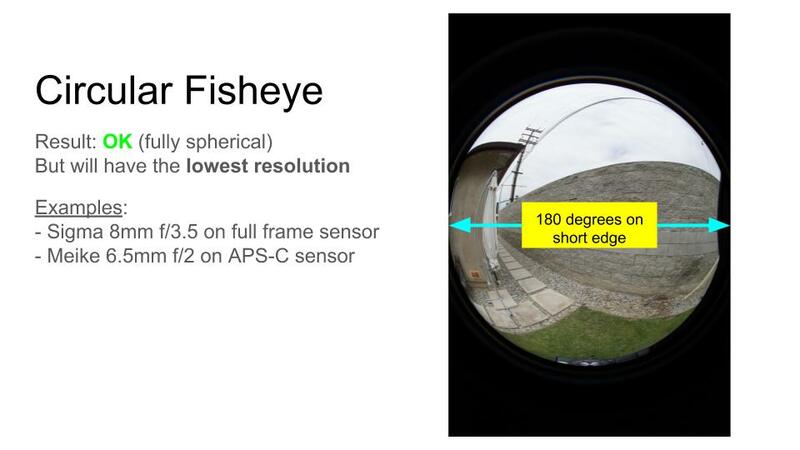 If you take a look at the “Full Frame Fisheye” section from Mics post above, that might make it easier to understand. You’ll see that Mic has his camera rotated so that the top right corner of the image is tilted to the zenith and the bottom left is tilted to the nadir. The picture of the camera shows that it is rotated on the mount exactly the same way you’ll need to do with your X-T2. The 90° thing probably isn’t necessary. Sorry for the confusion. What I meant was that with the camera pointing up to the zenith, I usually take the shot, then rotate the Nodal Ninja 90° clockwise (with the camera still pointing upwards) and take another shot. I do it for safety but as I said above, it’s probably not necessary. For the nadir, you’d have to remove the camera from the rotator to take a shot. To be honest, I usually don’t bother, as it’s usually quite easy to patch the small hole in Photoshop. Easy 360 photo animation app: you can share 360 photos as an animated video with this FREE smartphone app!